[Shelley Olson and I] walk out into the prairie—not chest-high grasses, because the big bluestem hasn’t yet begun to flower here, but a textural knee-high pool of stiff grey leadplant, bright goldenrod, thick-leaved mountain mint, and two kinds of bush clover: round-headed and prairie. Bush clovers are spindly, hip-high sentinels at this time of year. Their single stalks rise straight from the ground, with the leaves and flowerheads becoming weightier as they ascend. They are top-heavy; they bend in the wind. I easily spot the round-headed bush clover, the more common of the two. Its flower clusters are cat paws, fuzzy and tan, like bits of teddy bear. Its wide green leaves are arranged in familiar shamrock triads all along the single stem. The prairie bush clover, the rare one, is also the more delicate. Its flowers are hardly noticeable and its leaves are narrow, still arranged in groups of three, but more silver than green. Several short arms sprout from the main plant. Only on close inspection do the tiny flowers become apparent: white funnels with pink throats, each no bigger than a pea. They are loosely spaced and casually arranged, so unlike the furry masses of its cousin. The two bear only a passing family resemblance. The round-headed bush clover is the athlete, the letterman, the football captain, while the prairie bush clover is the ballet dancer. Shelley heads back inside the visitor’s center and leaves me to contemplate the prairie on my own. The wind is up and wafts across the landscape like gusts on a small lake. And as sailors learn to read the winds by their effect on the water, I begin to learn the plants from the wind’s effect on them. I stand on the trail and try to pick out the prairie bush clovers as they move. The round-headed clover is easy. Its stems lean down in stiff lines, and stay down; it reclines from its feet with its body straight. 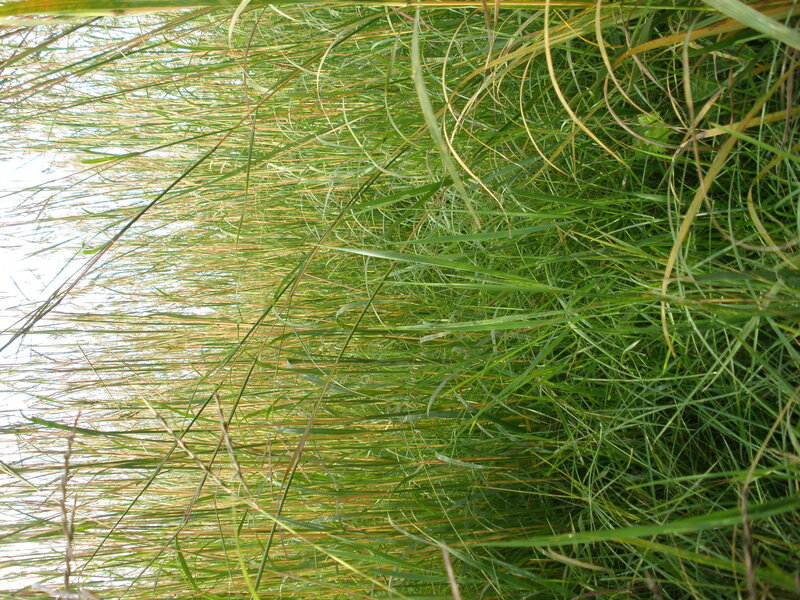 The fine grasses that surround it bend and flex rapidly. The burly leadplant nods its shaggy shrubbiness all at once, bowing politely. The milkweed flips up its broad leaves, as if raising its hands against the wind, while the spike gayfeather wiggles stiffly back and forth like a mast in the gale. Prairie sunflowers bob their bright heads on stems rendered invisible by the movement, leaving only yellow dots floating above the prairie. The seed heads of the red clover (an unrelated species) are solid and still, the black coral reef around which the rest of the grassland breaks. The prairie bush clover is graceful. It bends at its feet, like its cousin, but more rapidly, then drops its top farther downward. It executes a deep formal bow followed by a playful dipping head flick even lower. In a group, they are a chorus line at curtain call, slightly out of synch, lithe and confident. This is another excerpted chapter in a book-in-the-works on Minnesota’s federally listed endangered and threatened species. A piece on the Topeka shiner minnow appeared recently in Briar Cliff Review. Check out Michigan Quarterly here.